I've never felt so conflicted about my spoilers warning. The fact is, spoilers on this show really would spoil the experience--at least for the first-time audience member! Even the title...! One of the Nice Ones (by Erik Patterson--met him afterwards, such a nice guy!) is somewhat akin to The Usual Suspects in that everyone should enjoy the surprises totally the first time. Which is not to say this play is anything like that movie! Well, certainly this play is loads and loads funnier! In fact the very beginning seems almost like a sitcom episode. Tracy (Rebecca Gray) is having an evaluation review from her supervisor Roger (Graham Hamilton). They both work at a company that sells weight loss and health products, the former on the phones doing cold calls. A very stress-full, goal-oriented environment which in comedy's grand tradition gets cranked up into overdrive. But not into farce. This makes for an important distinction. Just this setting alone can offer all kinds of possibilities. Indeed lots of scenes at least seem to be the stuff of skits on SNL. Roger telling a rather-too-intimate anecdote to the mousy subordinate Neal (Rodney To) when Tracy comes into the break room, for example. Or Tracy, feeling frustrated amid a long unproductive day, dials it up to eleven on her next call while a fascinated/horrified Neal listens. All good stuff! In the right hands--and these most certainly are right hands--even asking for a sweetener can be (and is) dramatic to the point of humor. Yet this barely scratches the surface. Barely. Scratches. For one thing (and the poster is something of a clue here) these folks all work at a company focused on (some might say depending upon) feelings of individual self worth. Who after all really likes their body? In our society? Roger on the other hand goes on a long spiel at one point about how all that is essentially nonsense. Caring what others think, even admitting to one's own imperfections as being imperfect--symptoms of failure in his book. Of being a loser. Ironic, yes? But somehow very logical in a skewed way. The kind of skewed way reality and life tends to be. But maybe, just maybe, Roger has met his match in Tracy. Here we meet a young woman who has taken the idea of re-defining one's self to much, much further extremes. Indeed, by Roger's standards Tracy must be the most individually powerful person he's ever met. Except she isn't. Or maybe she is. Either way, you will laugh. Because if you didn't, you'd cry. You might cry anyway. 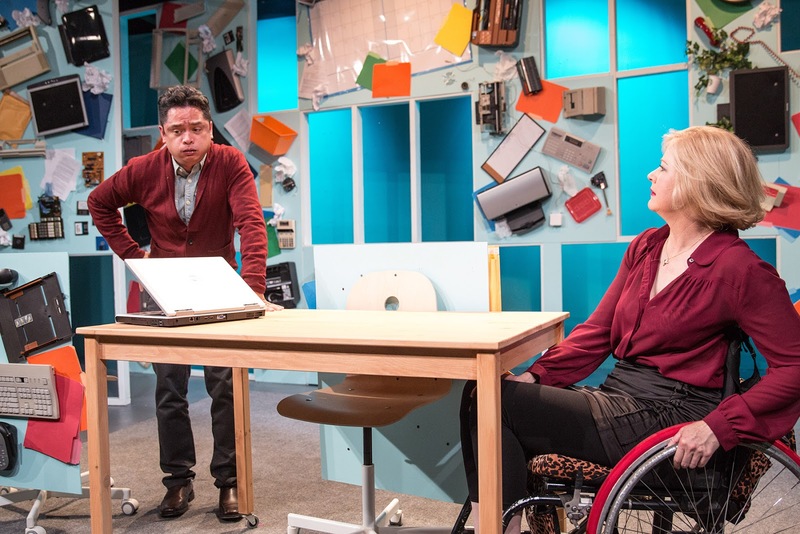 This play pulls that many rugs out from under the audience, in no small part due to the skills of director Chris Fields as well as the entire cast (including Tara Karsian turning in a delightful performance as a newcomer to this weird world in the last thirty minutes). One of the delights I had in the days after watching the show proved thinking back on all the tiny clues embedded in the text and in the performances. Sometimes I picked up on them. Sometimes. And I'm honestly still trying to figure out how to react to this play's very last line. For those who know me, this is high praise. 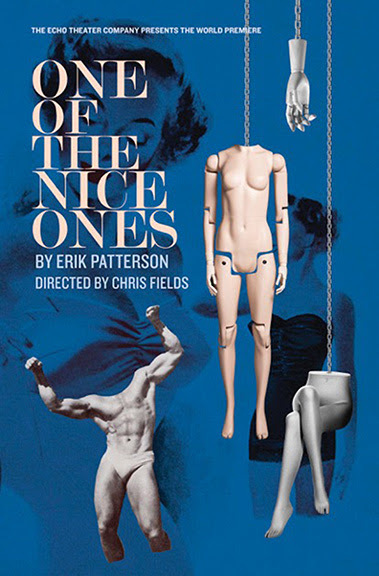 One of the Nice Ones plays at the Echo Theatre in Atwater Village, 3269 Casitas Ave, Los Angeles, California 90039 Fridays and Saturdays at 8pm, plus Sundays at 4pm and 7pm until Sunday August 21, 2016. 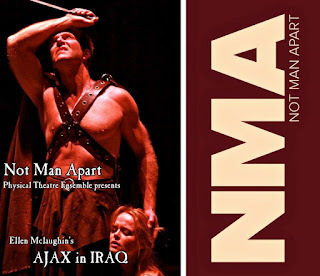 I'm not completely sure how many people actually "get" the title of this play, Ajax in Iraq. On the other hand, perhaps that is too much skepticism on my part. In the last year I've seen more than one play harken back to Greek myth and/or the Trojan War. Ajax was one of many Greek heroes in the Illiad, the ancient epic telling of that terrible conflict. On one level, this work offers a parallel between the Greek invasion of Troy and the American invasion of Iraq--two wars fought for confusing motives. In both cases the troops on the ground faced long weary years in the desert. Both became embroiled with internal conflicts. Both find themselves estranged from families, subject to baffling questions. Some even go mad. Or what seems like madness. It has become a cliche in our own fiction. How many episodes of Criminal Minds deal with some veteran snapping and becoming a danger to others? Well, it does make for an easy plot point. Here, though, we delve deeper. 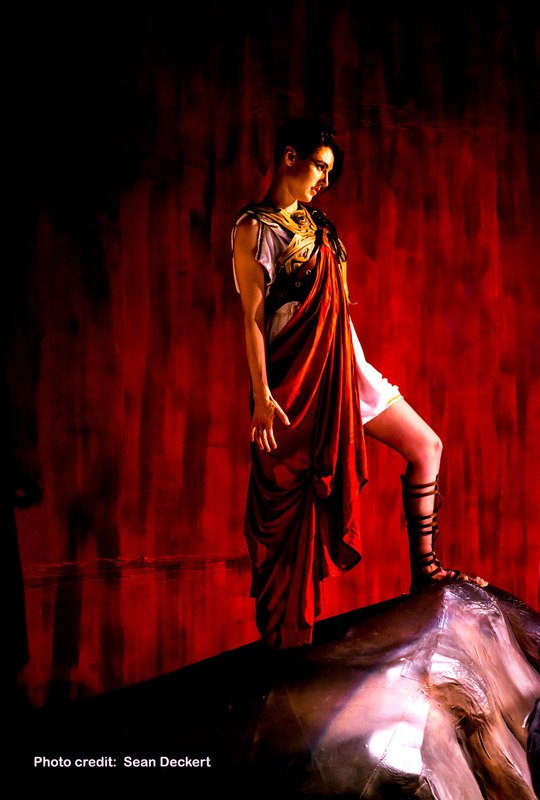 Ajax (Aaron Hendry) is a central tragic hero of the Trojan War, driven mad by the Gods lest his rage interfere with their plans, but who met his disgrace with vast courage, even wisdom. 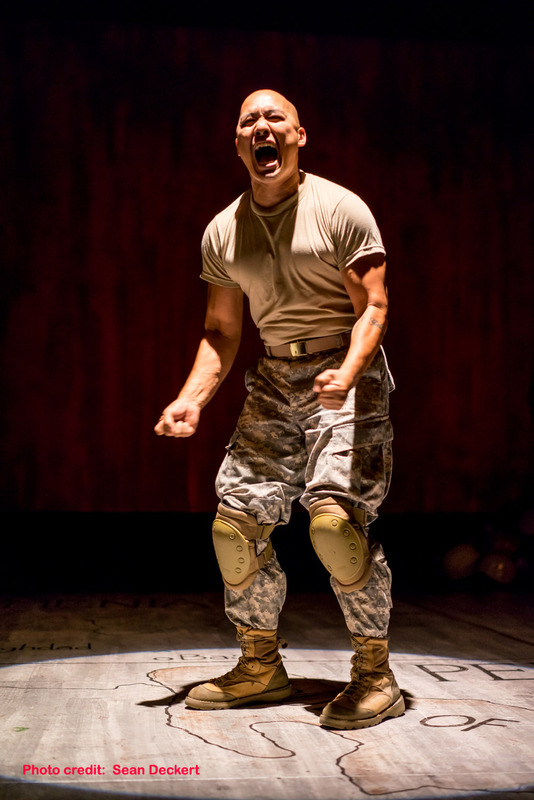 AJ (Courtney Munch), a modern US soldier, seems a parallel to him--driven to great acts of valor and of madness, who forces her comrades to react in wildly different ways--just as the Greeks did to Ajax. All of which sounds rather intellectual (especially coming from my pen) but that misses how incredibly visceral and physical this show is, in every single moment. Much of it seems as much a dance as a play (note: the Greek War God Ares is also the God of Dance)--the cast physically throwing their bodies into the conflicts within their story. From the front row on opening night, I saw the sweat dripping from them by play's end. All of which makes the story seem increasingly real, increasingly tangible. Even when the Greek War Goddess Athena (Joanne Bateman) shows up, wielding inhuman powers inhumanly--or maybe exactly as a human would wield them. The fact she comes across as a punk elf is just one of many startling ways the show slaps our expectations away. We see war is hell, in oh so many ways. But when it comes to laying blame, that is confounded. Nobody can even say for certain why anyone is fighting the war. Athena's idea makes as much as any--because warriors come to love one another, to trust one another above all else. But is that a good thing? Or bad? Both? Neither? Do Ajax and AJ act in the wisest, best way to what befalls? Do their compatriots? Do their families? Any answers--if there are answers--must come from us. Ajax in Iraq asks the questions, in such a way as we feel compelled to look for an answer. Which is what theatre does at its very very best. Meanwhile all those questions emerge in just about every threatrical form imaginable, all integrated together via theme and focus. A masked chorus acts and speaks as one. Individuals speak to the audience, trying to make sense of what they've seen and heard and felt. For one brief, raw-nerve moment Ajax and AJ see one another--and we feel it down to the marrow. Seemingly simple, realistic scenes between characters play out tiny human dramas which are the building blocks of the Epic. 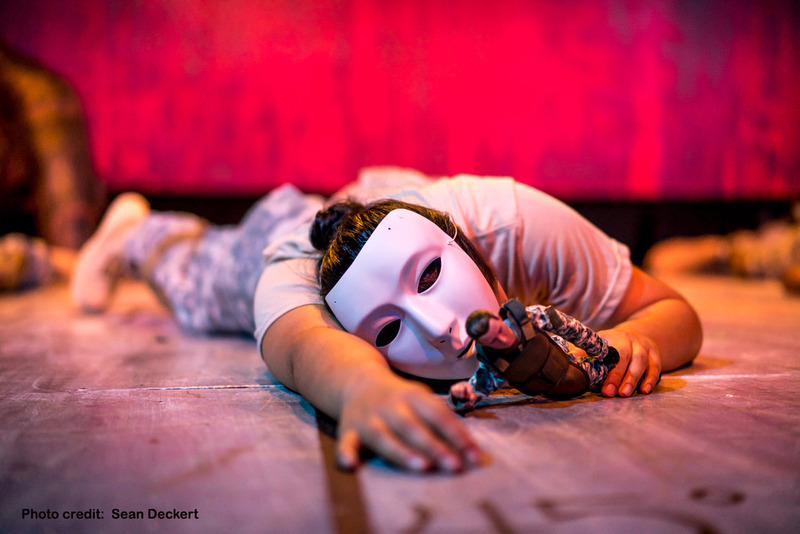 Dolls become avatars for the tragedy of war and warriors. Songs fill the air, coupled with dance, and ultimately become something like a mosh pit where Ancient Greeks and Modern GIs give voice and form to their glory/horror. Credit for this amazing piece of theatre goes to the rest of the cast as well--Alina Bolshakova, Laura Covelli, Sydney A. Mason, James Bane (his Sargeant proves very hard to forget), Jason Barlaan, Jessical Carlsen, Zach Davidson, Kendall Johnson, Jolene Kim, Ronin Lee, Frederick Ramsay Jr. and Olivia Trevino. They under the direction of John Farmasnesh-Bocca together gave breathing, dancing, bleeding and singing flesh to the skeleton of Ellen McLaughlin's fascinating script. Ajax in Iraq plays Fridays and Saturdays at 8pm and Sundays at 7pm through August 14, 2016 at the Greenway Court Theatre, 544 North Fairfax (north of the Grove, south of Melrose), Los Angeles CA 90036. One thing I truly adore about Art is how, at its best, it opens my mind to something new, something extraordinary. 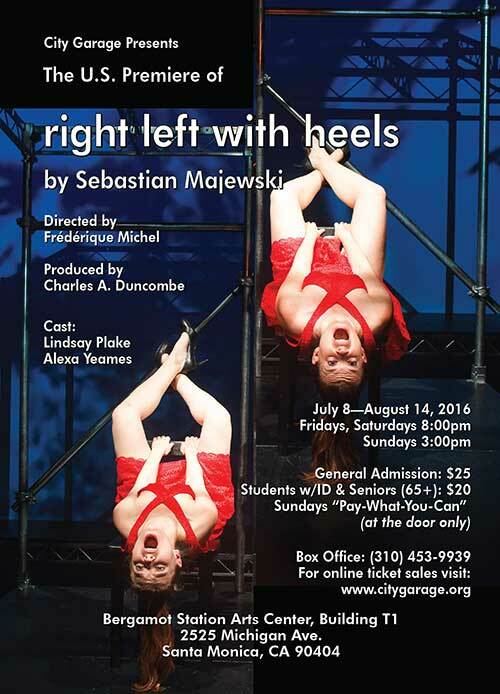 In the case of right left with heels by Sebastian Majewski, that proved very much the case. The two-woman play tells the story of post-WWII Poland from the narrow and very personal viewpoint of a pair of matched inanimate objects. Specifically, a pair of shoes once worn by Magda Goebbels (wife of the Nazi Minister of Propaganda--she and her husband poisoned their children before committing suicide themselves as the Soviets closed in). 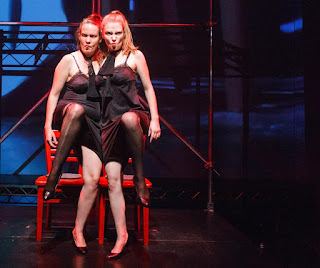 Right (Lindsay Plake) and Left (Alexa Yeames) face quite a challenge in making us believe in them as a pair of shoes. With the help of director Frederique Michel they succeed--but there's a lot more here than believing a pair of shoes might feel. After all, this ain't Disney. Not by a long shot. Poland as a nation has had its history re-written several times in living memory, even more often when you look further back. Portions of it have gone back and forth between Russia and Germany for instance. The Nazis made a point of trying to exterminate not only racial minorities in that nation but also the entire intelligentsia--the professors, historians, intellectuals, etc. Of course then came decades of Soviet Rule, a police state just as brutal in many ways if not as openly psychotic as National Socialists. Over time, and with Stalin's death, things slowly got better and then the Solidarity Movement eventually led to free elections and a break from Communist dictatorship. A re-examination of the past was part of that, along with a lifting of censorship. Street names in cities changed (not for the first time). Until recently, when a Right Wing Government won election, praising the "good old days" of authoritarianism and people simply doing what they were told. 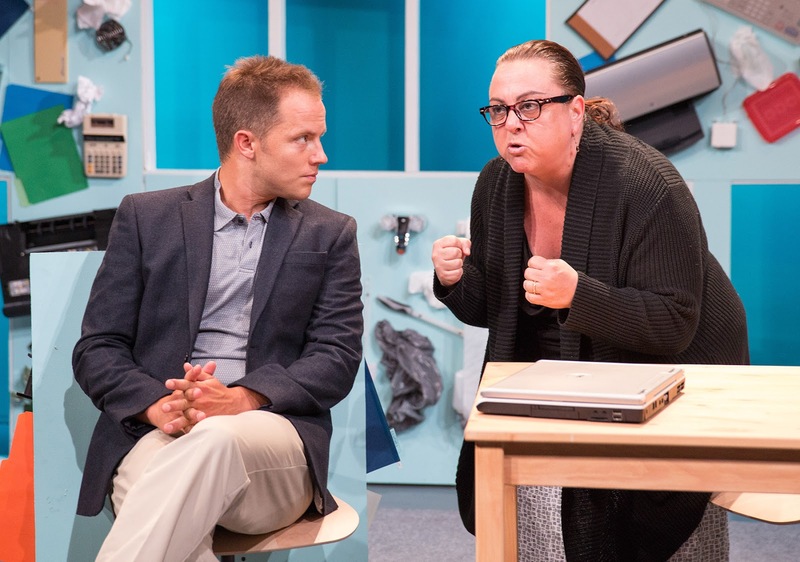 The Polish consulate (who celebrated the fantastic LA premiere of Our Class a few years ago) promised financial support to the City Garage for putting on this play. And then they very suddenly reneged. Remember how the Dixie Chicks were almost lynched for criticizing President Bush that one time? That is the kind of thing we're talking about. So...why? What's all the fuss about a play whose central characters are a pair of shoes? Because the play explores what happened to Poland in those long decades between the Second World War and today. The shoes themselves tell their story twice -- the second time with much greater (and often horrific) detail. So we see that history twice, experience it from different perspectives given greater context. The owners of the shoes vary a great deal, from a doctor's wife to a theatre company and finally a drag queen murdered in an act of "patriotism." Along the way, we the audience find much of what we believe under question. Not merely in terms of good guys versus bad guys, but about innocence despite one's origins, the troubling process of learning about our own past and how we re-imagine it for our own purposes (after all, it isn't as if governments thought that up on their own). In the end, my mind was blown, not only for the expansive nature of questions asked--and in that microcosm so much of LIFE ends up explored--but so many remain unanswered. The playwright, the performers, the director and whole production team aren't interested in telling you what to do. Such remains our job. A very hard, tricky and important job. Which a pair of shoes made for one of the worst women ever to live reminds us to do. Not that they themselves realize that! right left with heels plays Fridays and Saturdays 8:00pm, Sundays (which are pay-what-you-can at the door) at 3pm until August 14, 2016, at the City Garage, Bergamot Arts Center 2525 Michigan Ave, Santa Monica, CA 90404. Seems like I've been reviewing a lot of Othellos lately. Like, a startling number. There's something in the air, in the common atmosphere of this time and place...in fact there have even been productions I missed. Yet I've seen a lot. 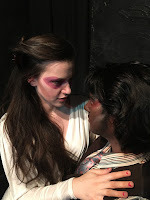 Othello at ZJU, directed by Josh T. Ryan, is a re-staging of an amazing production of this play last year. I reviewed it then, and eagerly awaited what a second iteration with a somewhat different cast would evolve into. Imagine my delight at seeing an improved show! Not a retread nor a copy but something new, coming from the same sensibilities and enthusiasm as the first! Forgive while I pontificate for a moment or two. 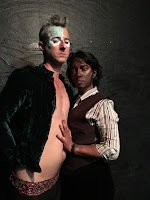 Othello is my least favorite of Shakespeare's great tragedies and in the last two years, having seen several excellent productions and/or experiments into the text (this one counts as both) the reason why became clear. Most companies do the play by focusing on the plot. Yet the plot at its heart is little more than a tawdry domestic tragedy about stupid people doing terrible and stupid things. However, the plot does not beat at the center of this play. Rather the world, the mise-en-scene, the environment waits for exploration. Not what happened to these characters, but why? In this, Ryan and his ensemble explored that very question with a brilliant showmanship. Relocated the whole story to the world of 1980s fashion, they immerse us in a world of raw and bottomless vanity. Here not a single life is really worth living because hardly one second of it has ever been examined. To make an error marks not human frailty, but actual SIN. To be found out, to be seen as wrong is a CARDINAL sin, demanding the most extreme of reactions. Like all great tragedies, the story is full to the brim with fools. Very pretty, very stylish fools to be sure. After all, they dwell in a cosmos where beauty and entertainment as well as indulgence infuse every moment. Othello (Vanessa Cate) is a fashion designer, quite simply a combination of monarch and god--object of worship, favor and of course envy. To be God's Favorite makes Desdemona (Amanda Dyba) a target, whether she realizes it or not--and no, she doesn't. Rather she exults in her position, thinking it eternal. The God she worships in turn worships her, after all. Against all this stands and weaves the brilliant, petulant Iago (Vincent Cusimano) who rises to take the place of all whom Othello favors. The bitchiest and most seductive--or at least desired--model of them all, Iago struts upon the stage equal parts Kardashian and Fallen Angel. His unwilling ally in all this, wife Emilia (Anna Gion), joined by an original character of a fashion photographer (Michelle Snyder) and of course others including Robbie McDonald (who has wonderful singing voice--he is the entre act as we wait for the play to begin, a show in itself), Kevin Alain, Renahy Aulani, Michelle Danyn, Peter Stickles, and Joel Patiño Corona. Did I mention this has been re-imagined as a musical? Well, it includes a lot of songs, anyway. And pretty much everyone in the cast seems to be sleeping with everyone else sooner or later. But even listing all the dizzying--and wonderful--liberties taken doesn't really convey the fun, the dazzle, the humor and the very real horror of this production. As time goes by, my favorite Shakespeare productions increasingly are those with a twist that takes me further into the play. This does precisely that--into a petty, dangerous, unbelievably glamorous and decadent story that of course can end no other way. Which is sad--and yet, funny. 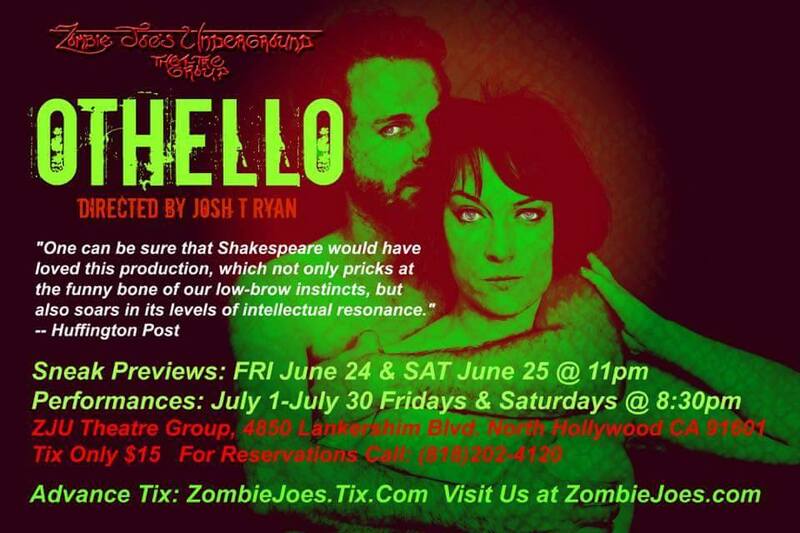 Othello plays on Fridays and Saturday nights at 8:30pm until July 30, 2016, at Zombie Joe's Underground Theatre Group, 4850 Lankershim Blvd. (just south of the NoHo sign), North Hollywood, CA 91601.